← Dude Food? No way! It’s Ladies Night. But one incredibly large serving would also do nicely, thank you very much. One very large serving, indeed! I’m more inclined to cut it into 1″ squares and snack on it from time to time. But if you want the entire pan, I’m down with that. Just have to figure out how to get it to you. (Always the trickiest part, isn’t it?) How are you, my lovely? This looks so good. And I love blueberries. I know what I’m making this weekend. 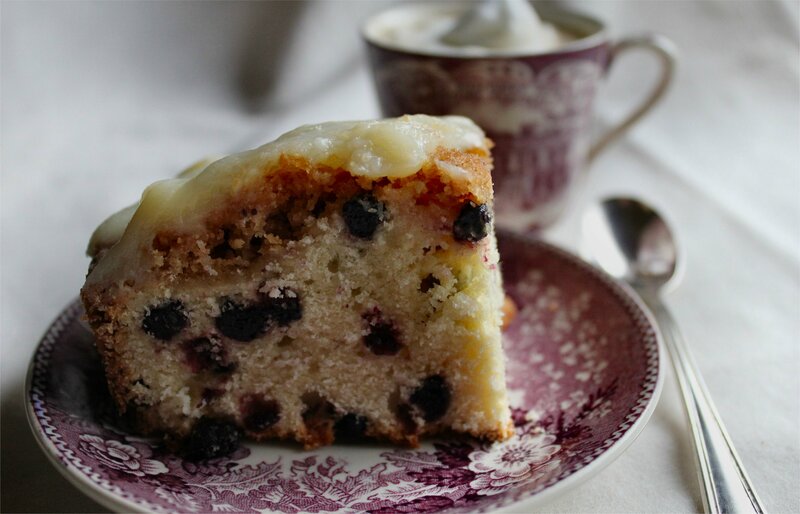 If you make it with fresh blueberries, just rinse them then toss them in flour. It will keep them from sinking to the bottom of the cake as it bakes. Hope you like it, Thoughtsy! I’d love to have some with you. That cake looks scrumptious! Well, bring the girls and c’mon down! NanaBread, I received your post in my email today, and just wanted to let you know that the picture was so huge I couldn’t even give it a good look. I’m not really computer savvy, so I’m not sure if there is something you can fix on your end, or if I need to do something on my end to fix the problem? Thanks for letting me know about your e-mail issue. I’ve sent an e-mail to WP support to see if they can help me figure out what the problem may be. I have one other reader who has reported having this same issue, and one other whose notification e-mail was completely blank. I’ll let you know what I find out. I looked up the recipe you mentioned on Tasty Kitchen, and it is very similar to mine. I’m not really surprised by that, since crumb cakes of all flavors seem to follow the same basic recipe. I will have to try her version the next time to see if I like the fresh blueberries as much as the wild dried ones. With such a glowing endorsement, I’d be crazy not to try it. Thanks for sharing the suggestion, Shari. Oh, my gosh…that looks totally heavenly. I just love those cute little dried blueberries. What an awesome reason to have cake for breakfast! Love that you put a cream cheese glaze over the crumb topping–way to go big! :) Promise me that when we finally have tea and cake together that we’ll use that gorgeous china! 4. You betcha! Nothing but the best for my buds. OHMIGOD. Kirsten and I are having another china mind-meld I think. The cake? Looks delicious and gorgeous. But mostly I would just like your china and silverware, please and thank you. Okay, ladies. I have to be honest; it’s not a set of china. As an antique shop hopper, I have developed a love for cup & saucer sets that are made of transferware. That cup and saucer is but one set in a small collection of cups & saucers. I wish I had an entire set of this stuff, but I don’t. The purple set in the photos is a new acquisition. It’s called “My Old Kentucky Home”. It is lovely. My goal is to acquire one cup & saucer set in all of the known colors of transferware. The silver spoon is from a set of 6 tea spoons I found at an estate sale. Paid $2 for the set of six. Couldn’t believe my luck. Thanks for feeding my obsession! Yes, I will absolutely meet you for breakfast. And coffee. And tea. Especially if you keep posting things like this! My next coffeecake will involve sour cream, cherries soaked in amaretto, and toasted almonds. How does that sound? 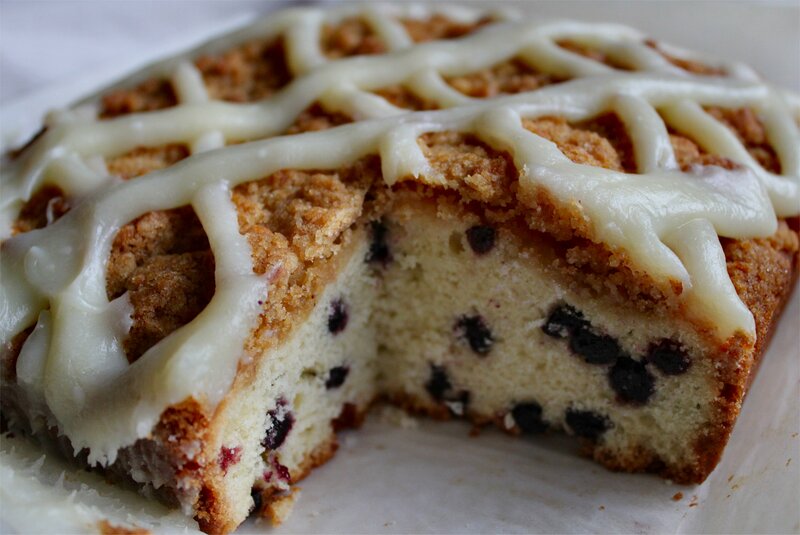 I love all things coffee cake, but the cream cheese glaze puts me over the edge. I wish I had a permanent spot at your kitchen table. Thanks, Anne! High praise coming from a baker such as yourself. When I make this one again, I’m going to stir in a little yogurt or sour cream & maybe even a little lemon zest to add some zing and a little more moisture. I like my coffeecakes to be super soft and tender. Can you believe I have never been to a Trader Joe’s? We have Whole Foods & Central Market, but no Joe’s. What’s the point in living in a city with 4 million people if you can’t shop at Trader Joe’s? It’s criminal neglect, I tell ya’. Awesome! Thanks so much for letting me know, Thoughtsy! This looks pretty good. I may try the recipe to serve after Easter supper. A friend of mine actually opened a new york style-crumb cake business called Crumb Cake Creations a few months ago. She’s doing real well with it, so I wanted to share it seeing as though they look similar to this recipe. Not sure if she lists any recipes on the website, but the cakes are darn good. I’ll check back here once (if) I go forward with the Blueberry Crumb Cake above. I love a good crumb cake, so I wish your friend great success with her new business. If you try my recipe, I hope you’ll let me know how it turned out. Thanks for visiting!